These Farm Heroes level 154 cheats and tips will help you beat level 154 of Farm Heroes. 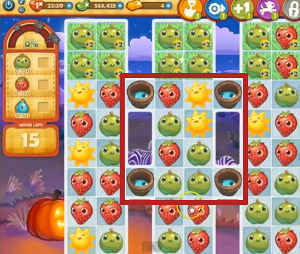 The objective of Farm Heroes level 154 is to obtain 150 strawberries, 150 apples, and 60 raindrops within only 15 turns. Since you have 150 of both other required crops to collect, you might think you should concentrate on accumulating them first before moving on the the raindrops. THIS WOULD BE DEAD WRONG. Since it takes three turns to create rain in the first place, it’ll be much more difficult to get enough to meet your minimum of 60. Try to make matches that touch two buckets at once to make the most of your turns. 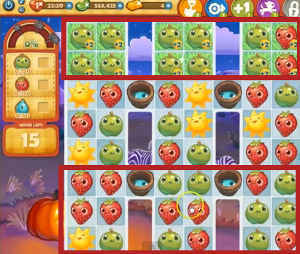 You have fewer turns than ever to get more ingredients–and you won’t even be able to make any horizontal matches, since the board is arranged into columns two squares wide connected only by buckets. Make as many matches of 4 and 5 as possible in order to get bonuses on subsequent matches; only then will you be able to approach your goal. Combinations of more than 3 prospective cropsies can be referred to as Chain Cropsy Combinations (TM). These bad boys spray +1 bonuses up and down the map, like it’s national febreeze bottle day but all the febreeze bottles are filled with +1 bonuses! This tip has been sponsored by febreeze. Febreeze! You won’t even smell the poop. Though it can often be counter-intuitive to make matches on the top of the board, in this case it’s advisable, since the top two rows are covered in green grass that will get you extra points and bonuses. Of course, if there’s nothing there, you can always try to trigger cascades on the bottom. 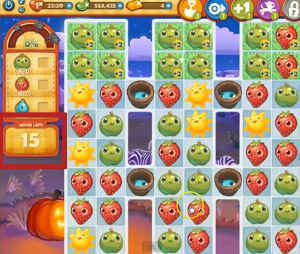 There are no carrots in this level, so the chances of creating a combo and beating Farm Heroes Saga level 154 are greatly increased. Cascades will be unlikely to happen on Farm Heroes Saga level 154, because the board is so thin. You need them thick boards for that cascade money. Think of thick boards like they’re Kanye West. They’re not always around to improve your day-to-day life, but since you threw that great party earlier, they stop by once in a while to talk about the sports cars they own.